"Looking forward, we’re really excited to start bringing fresh and unique content for players new and old." Risk of Rain 2 does a remarkably good job of re-imagining a 2D action roguelike in 3D, retaining the same feel despite the new perspective. I wanted to know more about that process and about what's coming next for Risk of Rain 2 in Early Access, so I asked Hopoo Games co-founders Paul Morse and Duncan Drummond. Here's what I learned. The levels in the game so far definitely have the vibe of Risk of Rain 1, but notably there's no Temple of Elders or Contact Light. Are you planning to add similar stages (or totally different later-game stages) during Early Access? Returning players wanted to come back to something familiar, so a lot of the early access launch content was updated and returning favorites. Looking forward, we’re really excited to start bringing fresh and unique content for players new and old, so we’re going to focus more on that. Maybe we’ll sprinkle in some returning content, as well, depending on our community. Which character proved the hardest to translate to 3D? And which do you think is most improved in 3D, compared to how fun they were to play in the original? Melee characters, like the Mercenary, were tough since we had to not only bring the character and their abilities to a 3D space, but also had to think about balance regarding large bosses and flying monsters. By working on his mobility kit more, we feel really good now about the Mercenary’s playstyle in 3D. As for the most fun, it’s hard for us to pick our favorite child but we’re really excited to see what our community shows an affinity to. As of today, how many copies of Risk of Rain 2 have you sold so far? 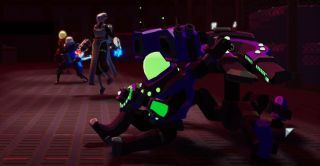 Over the opening weekend for Early Access, the Risk of Rain 2 community has grown to over 500K players. It’s absolutely surreal, and we’re so happy and grateful to our dedicated community who got us to this size so far. Can you lay out your broad plans for what will be added to the game during Early Access? Artifacts and at least 4 more characters are the obvious ones, just from playing the game! With the first patch having addressed initial community feedback, we’re now turning our sights to aligning on the early access roadmap. The plan is to deliver more content (characters, stages, bosses, and items) and to make sure the game is super polished by the time it officially launches. This will include additional game features, platforms, and localization. We expect this to be a mixture of larger content updates interspersed with patches and hotfixes—the cadence and amount of these will be announced at a later time. Has the popularity of the game so far made you change the scope of your plans for what you want to add to it? We entered Early Access with a plan and outline until 1.0 launch. We’re planning to stick to the plan we’ve thought out at the moment. Are you planning to support modding and/or Steam Workshop? This currently is not in our scope or priority but that doesn’t mean it’s off the table! A part of early access is listening to what the community wants and seeing if, when, and where we can implement it. My friends (who spent a good chunk of the weekend playing) want to know if you plan to beef up the ping system to allow for permanent pings to better keep tabs on items, the teleporter, etc. After seeing the great ideas implemented in Apex Legends, we implemented a new ping system and wanted to see how people utilized before beefing it up. A lot of people like it and we have plans to improve upon it based on the community feedback.